Installing drywall panels offers a smooth interior surface that you can paint or texture for a finished look. Sheetrock is a brand of drywall panel, manufactured by the USG Corporation, in Canada. Manufactured from pressed gypsum, the panels sell in 4-foot by 8-foot, or longer, sections and they come in a variety of thicknesses. Installing Sheetrock around a door frame is similar to installing it on a plain wall, but you will add a couple of steps to ensure even coverage around the door. Install Sheetrock around a door. Install the ceiling Sheetrock before hanging panels on the walls. Start at one end of a wall that has a rough-in door opening. 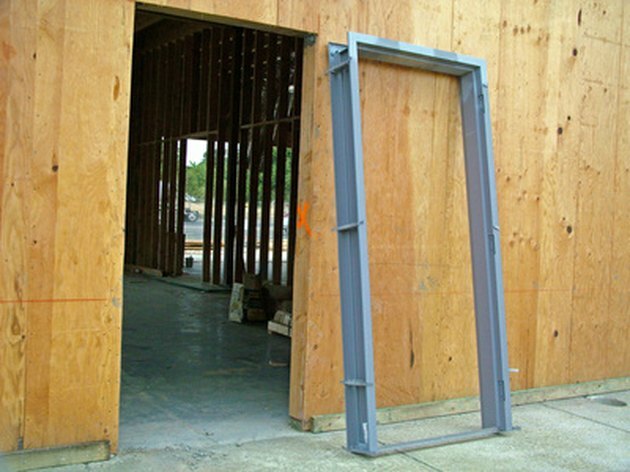 You will install the panels when only the framing for the door is in place, before you install the door jamb. Always begin at the edge of a wall, not in the middle. Install the first piece of Sheetrock, sideways, along the top edge of the wall. One or more assistants can push the panel against the corner of the wall and as high as it will go, pressing it tightly against the ceiling. If you're hanging the panels by yourself, use a drywall lift to hold them in place. Ignore the door frame for now and position the 4-foot by 8-foot piece of Sheetrock as if no door frame existed. Secure the panel to the studs using drywall screws. Place one screw approximately every 2-feet apart on a stud. The installed Sheetrock panel may now cover all or part of the top of the door opening. Step through the open wall studs to the other side of the wall and use a drywall saw to cut out the piece of Sheetrock that is covering the top of the door opening. There's no need to measure or use a guide; just position the blade of the drywall saw along the inner edge of the door frame and turn it on. Carefully follow the contour of the edge of the door frame and you'll cut out the piece of Sheetrock within the frame neatly. Install the rest of the upper Sheetrock panels around the room before installing the bottom panels. When you reach the door, repeat the procedure of putting a whole piece of Sheetrock over the door and then cutting it out from the backside. With this method, you need not pre-measure and fit small pieces of drywall around the door.